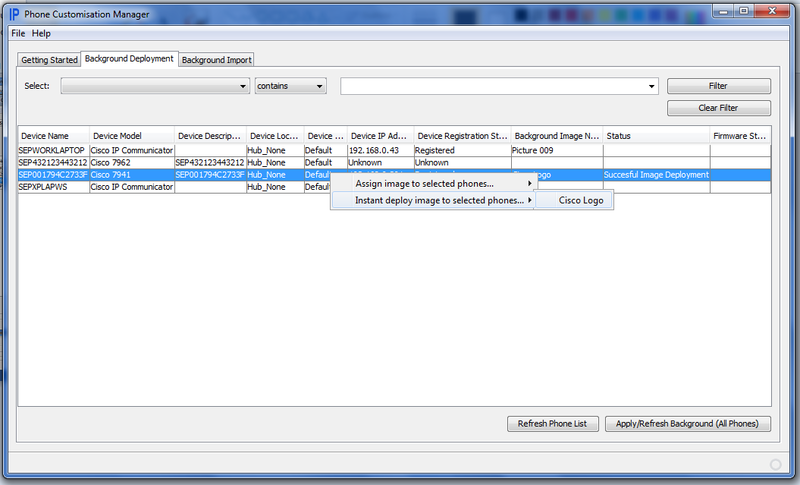 Our Phone Customizer is a tool for the rapid creation and deployment of background image sets or 'wallpaper' for Cisco IP Phones. It is designed for use by system administrators for rapid deployment to hundreds or thousands of phones using a push technique from your administrative PC. 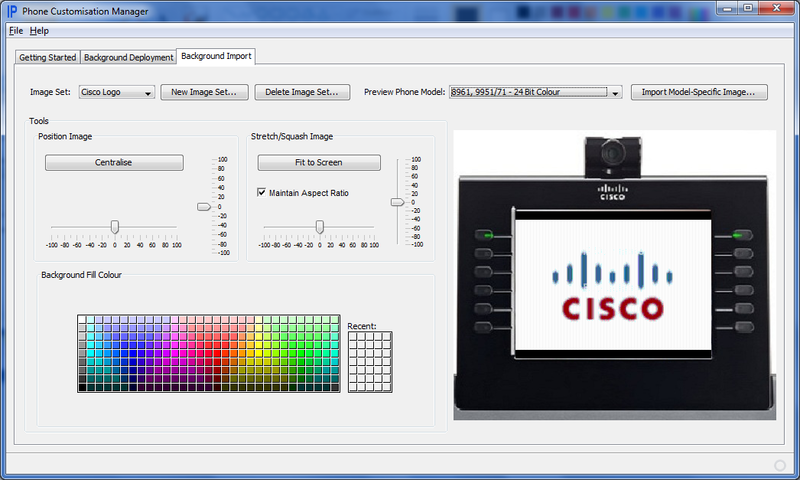 See this link for a video demonstration of how to push backgrounds to IP Phones quickly and easily! 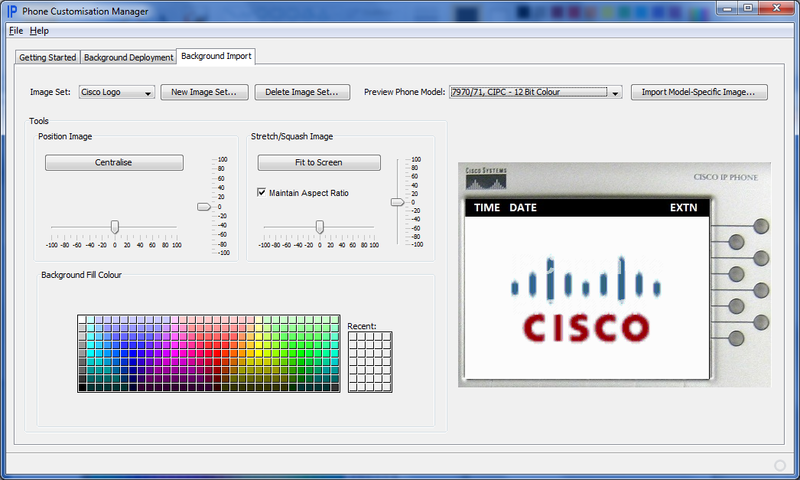 The Cisco Phone Designer tool is soon to be discontinued, and is designed for use by an end user with a small number of handsets. Our tool is designed for administrators. You can import an image in any supported format and it will automatically be sized to fit each background-capable handset display. After previewing and adjusting the images, you can then assign them one at a time or in bulk, and allow the tool to push the image selection out to any number of handsets. The downloaded evaluation product will include limitations such as a watermark on deployed images. A product purchase will result in you being issued a license that removes those limitations. This application works with versions of Communications Manager/CallManager from 6.1 upwards that have 'Phone Personalization' capability and IP Phone firmware that supports personalisation. Models Include: 7911 (new! ), 7941, 7961, 7942, 7962, 7945, 7965, 7970, 7971, 7975, 8961, 9971, 9951, Cisco IP Communicator. Cisco CallManager Express is currently not supported. When you run the application and connect to your CUCM cluster, the application will read a server identifier from your CUCM cluster. This will be displayed on the screen, and this should be emailed to support@ipcommute.co.uk to obtain a license for that cluster. If you have (for example) a single cluster, and a test bed/proofing cluster, the application can be used without purchasing an extra license in evaluation mode. The main limitation is that images deployed will be watermarked, however this is typically not a problem in these scenarios. To evaluate this product, please visit this page and purchase the zero-cost evaluation item to access the download. Please also see Phone Operations Manager, our latest product which includes ALL the functionality of this product and many new features such as remote control and inventory functions. Read more here! Finish your phone deployment in style with this tool to easily customise your phones with company branding. Super easy to setup and manage your background images and then deploy to 100's of phones in minutes. Highly recommended product for fast phone background deployment. I recommended this product to our company last year and i tell you that i had no regrets. Great customer support even until now! Hi nice tool that is sure to help in closing off deployments with a higher level of quality to detail. any upcoming support for the 8941 phones? IPCommute Response: Yes, 8941 support is in the current release of software, and further phone models are being added as I write this.